There is no doubt that I highly value the ability of science to bring our understanding of the world forward. But that doesn’t mean our perception of science can’t be abused. Good scientific research is objective. It’s conducted by people who devoted years of their life to learn the ropes and intricacies of their field. That is why in the end we award the best of them with the prestigious title “Doctor,” look up to them as authority figures, and hold the sentinels that guard the quality of science and its champions – our universities – in high regard. Usually this works very well for us. The assumption that a professional gives us qualified advice takes a huge chunk of decision-making off of our shoulders, no matter if that is the plumber who fixes our kitchen pipe, the doctor who prescribes us a medicine against our illness or the scientist whose research leads to a discovery that betters our lives in general. At 0:06 the video identifies the speaker as “Dr. Magda Havas, Professor, Trent University”, giving us three strong indicators that turn off our safeguards against unconditionally accepting someone’s opinion: she has a Ph. D., she is a professor and she works at a university. For most people that is enough to accept her credibility, especially when she talks about radiation, a subject we instinctively fear and concerns something highly abstract. On the issue of health effects of radio frequency waves, a large body of evidence now exists, and the international consensus is described in the references listed [on the physics website]. Based on these considerations, we do not believe that electromagnetic waves associated with WiFi in schools pose a health risk to children or teachers. It makes you wonder when what looks like the entire head of Dr. Havas’ university’s physics department, and therefore scientists truly qualified on the subject of radiation, feel it necessary to publicly voice their dissent. But Dr. Havas peculiar use of science, its processes and the value we place on them doesn’t end here. Whenever I post a video or article on the subjects of nutrition, fitness and all the rest, I try to give you links to the research that backs my opinions. Due to their highly technical nature these papers aren’t easy reading, but they are there, open to your scrutiny. However, some of you may simply take my opinion as correct and don’t bother with going through them. Because you see me as an authority on these fields and having links to the research seems enough to further bolster my credibility. I feel very honored by this trust, but I also see it with a lot of unease. I try to be objective, but what if I’m wrong or try to exploit your faith in me? Microwave exposure of 100 male rats (and 100 sham-exposed controls) at SARs of 0.4 to 0.2 W / kg (pulsed, 2,450 Mhz circularly-polarized microwaves at 21.5 h / day, for 25 months) showed no biologically significant effects on general health, serum chemistry, hermatological profiles, longevity, cause of death, and lesions associated with aging and benign neoplasia. They go on to state that there were changes in corticosterone levels and immunological parameters at 13 months (which were not found in a follow-up study) and that there was an increase in primary malignancies in exposed animals. Experiment was terminated after 25 months. Had it gone on longer whether the cancers were relevant biologically could have been determined. In other words, according to Dr. Havas, if the experiment had just gone on long enough, it would have shown that she is correct. That is a rather weak defense. The average life expectancy of rats is 2 – 3 years and it would have taken some pretty strong necromancy to let the experiment go on further – it simply ended when the rats reached old age, having been exposed to strong microwave radiation all their life. And Dr. Havas is still not finished. The scientific community places a lot of emphasis on publishing your work in peer-reviewed scientific journals, where other professionals in your field evaluate its soundness before they give their ok for publication. Getting your paper into one of them, especially those very respected, therefore isn’t an easy task and requires you to put quite a bit of quality into your research before submitting. If a journal published a paper that later turns out to be false, it would lose a lot of its credibility and its entire review process would be questioned. But this whole procedure and the journals whose opinions are really trustworthy are only familiar to those involved in scientific research – nothing keeps you from funding your own scientific journal. One that specifically exists to accept papers that would never make it through the quality control of the real ones. As long as Dr. Havas more or less stayed within her field of botany, she managed to get published, but the more outlandish her claims about radiation became, the more unlikely they were to appear anywhere. Her last paper published in a journal that can be taken seriously dates from 2008. That is a grave impediment for any scientist worth his salt and given her credibility at that point it also didn’t look like this would have changed for the better any time soon. 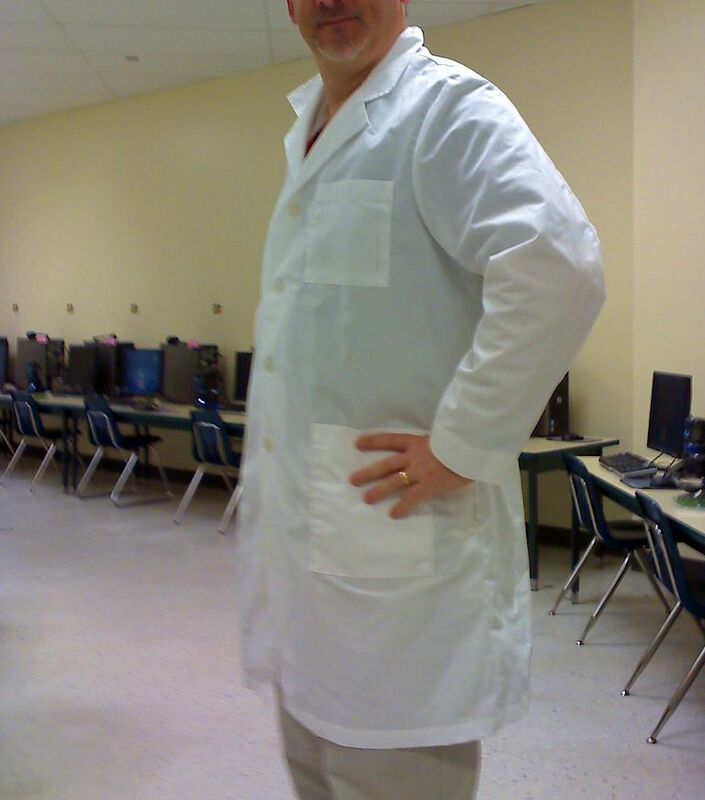 He has a lab coat, he must be a scientist. To her rescue came the European Journal of Oncology, founded in 1997 by the Italian Ramazzini Foundation, whose research on cancer and aspartame was discredited by the health authorities of both the US and EU. They had been so unhappy with being shunned by the scientific community, that they did what I described above: start their own journal to get their research published. The Foundation was more than happy to accept Dr. Havas’ 2010 paper, “Provocation study using heart rate variability shows microwave radiation from 2.4 GHz cordless phone affects autonomic nervous system” (PDF), although it violates most principles of real research, eg. the randomization of test subjects and having a control group (an in-depth look at the study can be found here). But Dr. Havas finally could rest assured that the paper that may mean the most to her got published. Somewhere. Because to anyone outside the scientific community she added another notch on her belt of credibility. Who not familiar with these journals can tell the European Journal of Oncology apart from the respected European Journal of Oncology Nursing? All this hard work on creating respectability of course was done for a purpose. Especially in Canada, where Dr. Havas resides, she uses it to put pressure on decision-makers and create anxiety. Canada’s Green Party cites her work in a fight against “wifi pollution” and her open letters to parents have them fear for their children’s health. It even goes as far as influencing public policy concerning cell phones. Dr. Havas hands out a belief disguised as science and – ironically – it is modern technology like the Internet that makes it possible for her to reach much further than she could have in previous decades. If people like her take advantage of platforms like websites and online video, the scientific community better catch up, or it may have public perception of science dictated by “researchers” of similar ilk. For more background information on microwave and cell phone radiation, please see this video and this article. Addendum, May 14, 2013: My comment and Dr. Havas’s reply mentioned above have been removed, presumably by herself. Pictures courtesy of Manuel Iglesias and Kevin Jarrett. Thank you! That was a great compliment! The wireless industry and its supporters have a lot to lose if people start paying attention to the studies that show harmful effects. It reminds me of the tobacco industry situtation, which duped people for decades. Havas is concerned about the impact of this technology, and numerous other studies (recent AND older) show good reason to apply the Precautionary Principle to wireless use and expansion – unless you want to play Russian Roulette with public health. Can you dismiss all of these? The point of my article was not to prove that there is or isn’t a harmful effect of microwave exposure (although it is very unlikely, as this meta-analysis shows), but that Dr. Havas sells as fact what at this point at best is only supposition and that she pretends to employ scientific methods where in reality she doesn’t. Thanks for this…the latest one she is pushing is that fluorescent light bulbs cause diabetes…you may want to take this one on as well. Thanks for the heads up! At this point, nothing she says should really surprise me anymore. You dismiss the possibility that RF has detrimental effects as highly unlikely based on one meta-analysis that actually states: “at certain RF radiation exposure conditions, there were statistically significant increases in genotoxicity for some end points.” Besides, there are much more than just genotoxic effects on the human body. This is a very complicated subject and modulation types can cause a big difference in outcomes. Also, certain individuals are much more susceptible to the effects than others. A sample of one hundred individuals may not have a susceptible subject in the sample. A confirmation follow-up study may be opposite because it does. A small dose can be beneficial, while repeated doses over time are detrimental. RF exposure is cumulative, and like tobacco, the true health effects may not manifest for another decade. 75% of industry-funded studies show no health effects from microwave radiation, but the opposite is true for non-industry-funded studies. Is that industry-funded science good science? Much of it has been shown to be full of flaws, but that is always overlooked because it got the results that industry wanted. It’s money that matters in this world, in case you hadn’t noticed. If you are a physicist, then it seems to me you are not very familiar with how a representative sample is chosen. The link you provided does not point to a paper, but just an article that references some papers, of which most have been superseded by more current research or aren’t even closely related to the subject. I am speechless. This “Dr.” Rhoda Zione Alale is possibly the worst crackpot I have ever heard. And she even has the nerve to claim to have been nominated for the Nobel Prize in physics!!! Outrageous. People like Magda Havas and Rhoda Alale are dangerous, spreading their insane mental pollution to gullible persons who may truly suffer from various symptoms, and believe this crap instead of getting proper help. Nothing much I can add to that, beside that I just looked up Rhoda Zione Alale and, well, she and Dr. Havas should get along just splendidly. “Dr.” Alale lives in Wilmington, OH, and just today the Wilmington News Journal ran a “news release” about her affiliation with Columbia University. I suspect that the news release did not come from Columbia. A couple of years ago, she claimed an affiliation with the Cleveland Clinic. When the Cleveland Clinic heard about this, their legal department had a few things to say. Small towns are very forgiving of their eccentrics (and I’m being generous with the term). I would suggest cases like this call for way less tolerance. Thanks for this! After watching her video every bit of my sceptical mind was screaming bs!! Next thing I googled was Magda Havas debunked and that led me here. Thank you for taking the time and writing this up and doing it so well. Dr. Havas is doing her best to feed nonsense to already overly scared parents and health nuts. Thanks for believeng in actual science and properly performed experiments and studies.